Recently, I spent quite a bit of time organizing my stash. I realized I have A LOT of fabric. I've also realized it's actually quite overwhelming, but then I just buy more. I do love buying fabric. I have lots of things I'd like to improve on in the coming year, but I'd really like to kick the fabric-buying addiction. 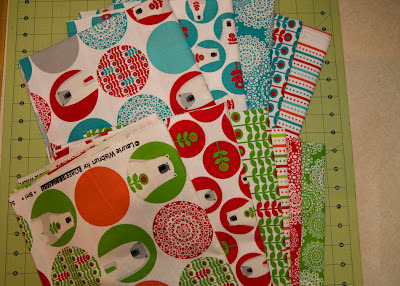 I'm planning to sew almost exclusively from my stash in 2012. I have a few exceptions. 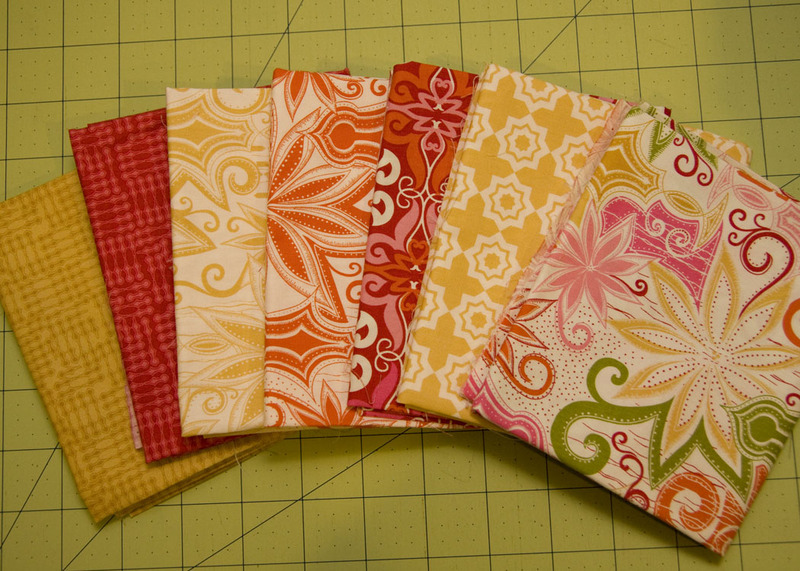 I will allow myself to buy whites and other solids as needed for sashings, but not for entire quilts. I can also buy batting as needed. I am buying Flea Market Fancy. In fact, I've already pre-ordered through Brenda at Pink Castle Fabrics. That's my one big huge exception. I already have plans for it. I'm also thinking seriously about de-stashing some fabric. We'll see what becomes of that one. 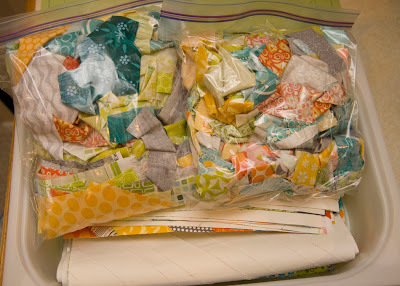 Box #1: Color Wheel Charm Swap project--I'm cutting all of these into 2.5" squares to make a wonky star quilt. I thought about making the stars with the full 5" charms, but I like the smaller stars so much more. And besides, as my husband says, "I don't have a plane to catch." I have time to work on this one. Strike that, I've already changed my mind since writing this post a few days ago. Now I'm not sure, but something will happen with this box this year. Between three charm swaps and some I've cut from my own stash, I have over 400 charms. Box #2: Cutting into my DS fabric. This will be a simple square-in-square quilt set on point. 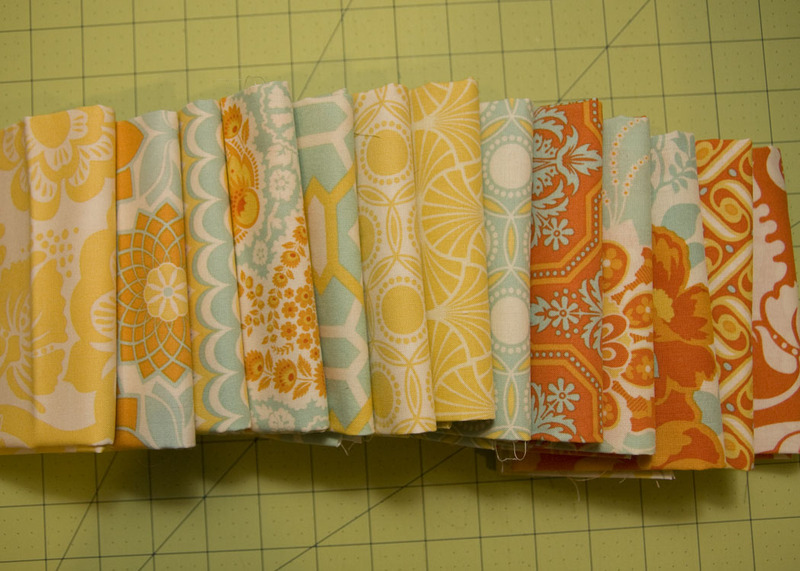 Of course, a fun quilt will come from this stack in the next month or two. I'm still thinking on this one. 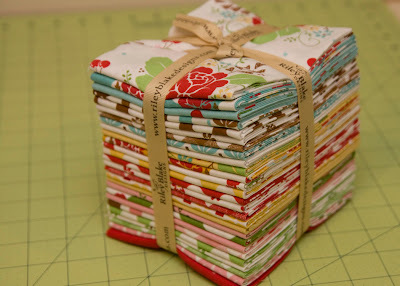 I won this stack of Sew Cherry at Sewing Summit and would really like to use it this year. 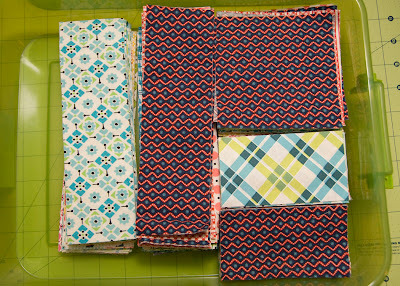 Box #3: Strips cut and ready for a fun and different strip quilt. Box #4: About 20 strings blocks from my local quilt bee buddies. 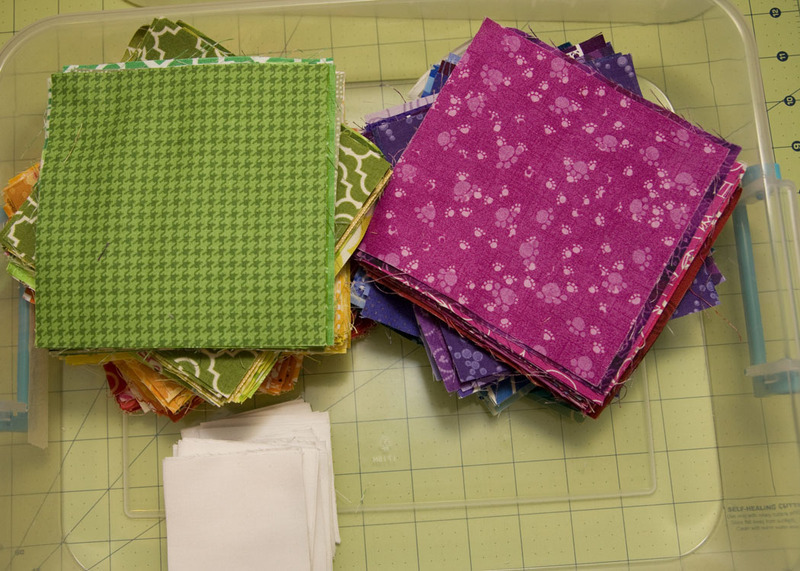 Since taking this picture, I've made 10 more 12x12 blocks for the quilt. I have enough scraps to make several more. I'm thinking I'll work on 6 more blocks at make the quilt 6x6 blocks. I won this in a Fat Quarterly contest months ago. It needs to be a quilt for my kiddos. I bought this at Quilt Market last spring. I still love it. It needs to be a quilt. I received these from Ryan Walsh in the Secret Santa Swap. I'm thinking a Market bag or two. Bought these a while ago on a whim and a 30% off sale. I'm not sure what they need to become, but they are so stinkin cute. Bought these months ago. They need to be a quilt or a couple more market bags. Here's to a stash-purging year! I'll be posting my stash purging projects throughout the year. Just two days ago, I cut out a new baby quilt for a friend, pulling everything from my stash. It felt great using some fabrics I bought for another project, but never used. 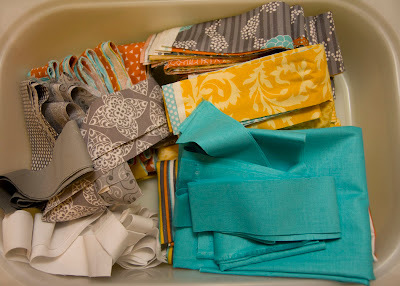 I've notice several other bloggers committing to stash-purging as well. Good luck to all of us! I'm sure we'll need it. There are just too many tempting new fabrics out there. We'll see how strong my resolve is. STOP IT! I've not yet bought any fabric in the sales, thinking I have plenty of fabric I don't need more, and now I've read this and thought I must go and buy some fabric! HELP! 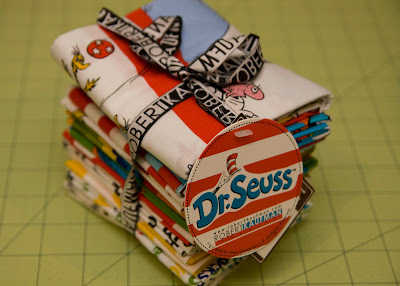 Holy fabric envy :-) You have me inspired to do something with my overflowing bins of fabric, can't wait to see what comes from all those bins of beautiful fabric! Oh man, me too. 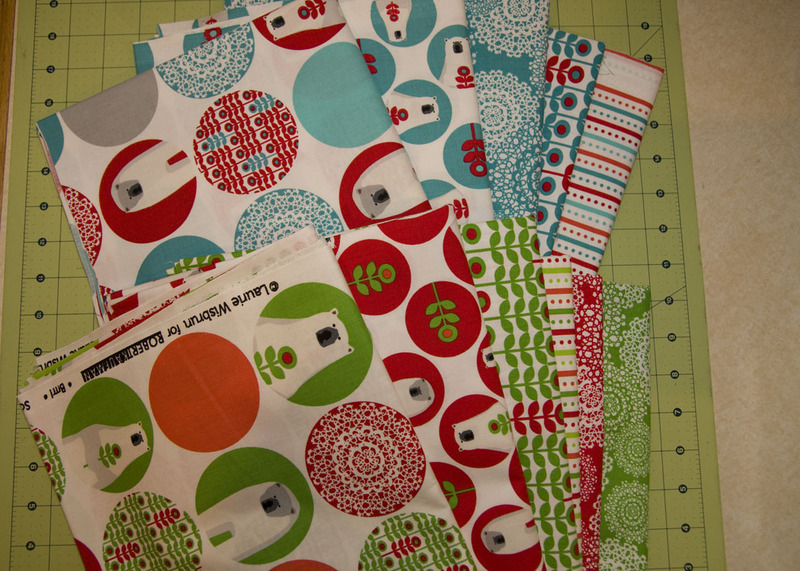 It's so so hard not to buy more than I can keep up with actually sewing! This year I've got a specific goal about what I want the stash to get down to in size and I really really want to get there! Yay for the stash busting! 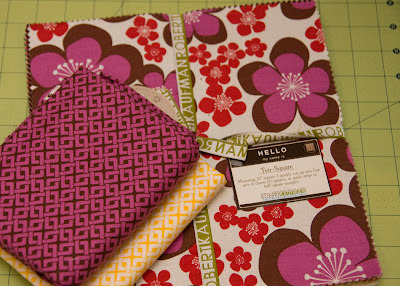 I am using my swap charms for the Made In Cherry quiltalong over at Pins & Bobbins. A good plan! My stash isn't that extensive, but still....it's good to use what you have. Good luck! That's a great new plan! I spent the past 2 years on my stash and it's great. It evolved over time, but being more aware in general of what you use is a wonderful exercise. I track all my fabric both in and out-by-project. The 5-quilt challenge with Leigh over the summer was great for trying to get stuff done without buying more white/neutrals. That is definitely where I need much more than I think. I'm with you! I really need to work from my stash as much as possible this year, but I'm making an exception and buying FMF as soon as it comes out! Good luck and I 'm looking forward to working along with you! I also have found thatmy stash is getting ridiculous, and it seems my quilting is slowing down a bit as I also start to hoard yarn for my latest knitting obsession! My buying seems to be outpacing my using of fabric....I definitely plan to use some up this year. But I am not canceling my FMF preorder, either :). My other motto- it's not likefabricexpires, it will still be good I years to come! I'm with you there. I have MORE than enough fabric to sew from my stash exclusively! I'm not going to commit to all of 2012, but I want to make a serious a dent before I buy anything more. So many fun projects! I can't wait to see them! This is definitely how I've been feeling lately too. I feel like I'm surrounded by stuff that I don't use and I'm just done with it! So while I'm not making any grand plans to only sew from my stash, I'm definitely "shopping the stash" first for yarn and fabric before I do any real shopping! 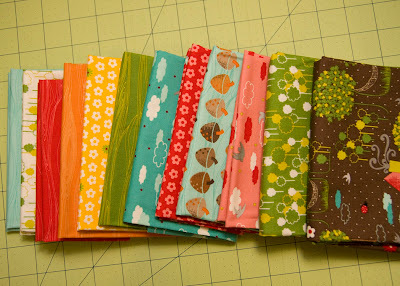 Oooh, so much fun fabric - I know you'll have some beautiful quilts by year's end!! I'm especially smitten with the Heirloom fabrics myself. I snatched up a few half-yard prints towards the end of the year, but I'm at a complete loss for what to do with them right now. Good luck with your conversion of stash to quilts/bags. I've just splurged in the Black Friday/Christmas/New Year sales to build up my stash, but from now on, I'll be keeping to only buying for swaps and bees fabric wise until I run out of things! When I was making my market bags, they were all from stash too and it just felt so good to use it! I'm with you on this one and plan to buy as little fabric as possible this year. I saw a good tip from another blogger - to unsubscribe from all those newsletters with the pretty fabric pictures in them! Good luck keeping up with it! I know exactly how you feel. I am in the same boat. 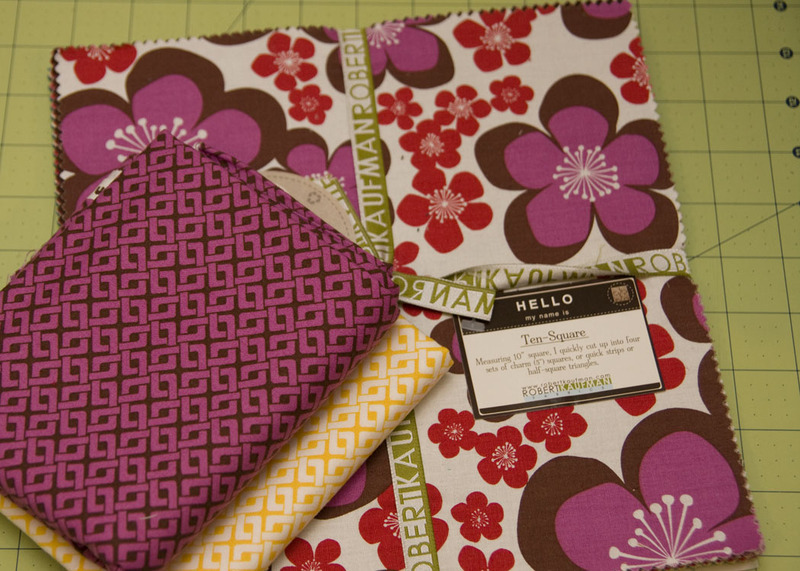 I told my daughter I would purchase NO new fabric in 2012, then ordered a layer cake of Half Moon Modern. (I mean, come on, how can you not?) But I'm definitely back on the wagon. I'm going to try this year too. Really try. My main objective is to only by fabric if I have a specific plan for it. It sounds easy, but it will be a challenge! I'm going to try to work a lot from my stash this year too. Although I know I'll still buy some fabric. I figure if I use as much from my stash as I buy, then at least it won't get any bigger! I like box no. 3. The color combo is exactly what I like at the moment. Maybe I have to make a quilt in such a color combo sometime. What fabric is the aqua?! It's wonderful! Thank you for your idea you used on your "12 days of christmas quilt. I used it for my flying geese units I'm currently working on and made cute little HST from the sides that needed to be cut away. I look forward to turning them into something wonderful (pillow etc.). I like your blog and will come back. I just want to offer to take some of that stash burden off of you! Seriously, that fabric is so pretty. Ill bet you make some lovely things. That is one theme I have noticed over and over now that I'm finally catching up on blog reading, and that is sewing from our stash. That is also my goal. I have actually looked at my stash in the last month, sighed, and said out loud, "This is just too overwhelming," clearly a sign of too much fabric! But on the other hand, I know what you mean about the tempting new lines coming out....it's a dilemma! P.S. I made a string quilt in that arrangement (but much smaller) a few years ago and it's one of my favorite quilts. Yours looks great!